Two Loaves of French Bread! 1 tbs fat - can be margarine, shortning, etc. approximately 2 ½ to 4 C all purpose flour. - Put 1/4 C warm water. - Sprinkle yeast over surface - wetting each pellet. Pour (1 cup) boiling water over it. Use the wisk (or wooden spoon) to dissolve the contents of the bowl. Add 3/4 cup cool water to cool the mixture to luke warm. Thoroughly mix the small bowl of water and yeast. Add water yeast mix to the large bowl of blended, luke-warm ingredients. Mix completely (using a whisk if available). Add 2 Cups flour to the mixture. Beat in thoroughly so the batter flows smoothly (the wooden spoon works well but a whisk is a the ideal tool). Add 1 Cup flour and beat in (with the wooden spoon) until smooth. Add 1 Cup of flour - 1/2 Cup at a time beating until absorbed. 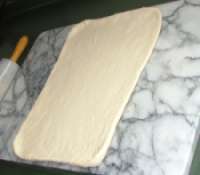 Turn dough onto a floured work surface adding flour 1/4 cup at a time adding only enough so the flour stops sticking to your hands (1/4 cup to 1 1/4 cup depending upon the kind/quality of flour, elevation, humidity in the air and other factors). Knead until the dough is a smooth and silky mass and is feels alive (is responsive) under the hands (7 to 10 minutes). rub vegetable oil (or the fat of your choice) onto the surface of the dough. Return the dough to the mixing bowl and cover with a plastic or wax paper sheet or with a pot lid. Place in a warm, draft free place to rise until double in bulk (approx 80 minutes). When doubled in bulk (approx 70 minutes), turn dough out onto lightly floured surface. Press bubbles out of dough (punch down dough) and divide into 2 even parts (place one part aside). Roll out one piece to a rectangle - approximately 16" x 10" (41 cm x 25 cm). Roll up dough (tightly without squeezing) along length (so you have a 16" long loaf). Pinch seam and ends and lay on greased baking sheet - seam down. Cover loaves, loosely, with a sheet of waxed paper and place in a warm, draft free spot to rise (approx 50 mins.). Slash the two loaves across the top (3 slashes looks nice). (Optionally - then sprinkle loaves with coarse salt). Put loaves (on baking sheet) in the middle of the oven for about 25 minutes. At 25 minutes remove the pan of water and lower the heat of the oven to 350, turn the loaves and bake for an additional 15 minutes or until done. Check bread for doneness by turning it over and tapping on the bottom. A hollow sound means the bread is cooked inside. Turn your breads or rolls in the oven - to expose the loaves to different parts of the oven. This helps to insure even cooking since heat is never perfectly distributed throughout the chamber. This French Bread recipe makes two 16 inch French Loaves As with all Galganov recipes, no special tools are required. We assume, however, if you have special tools such as a dough hook, that you know how to adapt for it. Read the recipe through in advance of begining. Get a bit of an understanding about time you need and how to set yourself up to do it most easily. Fact is, there is no substitute for fresh French Bread. This same recipe can be divided to make wonderful French Rolls, one loaf and several French rolls, or divide and use it any way you wish. Remember to let your breads cool a bit before serving. Truly fresh bread does not cut well. It must cool to be enjoyed. The structure of the bread sets a little and it does not, once cooled, collapse under your hand. The French Bread or Roll, when cooled, has soft, slightly chewy cells under a beautiful, (optionally salty) crusty exterior. Some will insist that a good French Bread must contain milk. If you are of this mind use a neutral or complimentary tasting fat.